What the latest news means for UPS. Right in time for Valentine's Day, United Parcel Service (NYSE:UPS) and Clean Energy Fuel Corp. (NASDAQ:CLNE) just announced they're deepening their relationship with another natural gas deal. Here's what you need to know. United Parcel Service has agreed to use up to 500,000 gallon equivalents of Clean Energy Fuel Corp.'s renewable liquefied natural gas (RLNG) annually in Texas. The new terms sit on top of a pre-existing deal between the two corporations for UPS to purchase up to 1.5 million gallon equivalents of renewable compressed natural gas annually for use in California. The Texas deal is enough to fuel around 140 UPS tractors, while the Cali contract accommodates nearly 400 vehicles. Renewable natural gas is helping us to meet growing customer demand while reducing our environmental impact. Today's agreement demonstrates UPS's commitment to develop alternative fuels and advanced technologies. By the end of 2017 we will have driven one billion miles with our alternative fuel and advanced technology fleet. United Parcel Service's decision to up its ante on alternative energies comes for two main reasons: cost and diversification. Cost is a critical concern for United Parcel Service investors. In the risks section of UPS' annual report, it notes, "Changing fuel and energy costs may have a significant impact on our operations." The company manages some of this volatility by adding on fuel surcharges -- in fiscal 2014, these averaged 10.2% for domestic air and 7.1% for ground products. But these surcharges are lagged, and despite cushioning the ups and downs of fuel costs, are still ultimately tied to the billions of dollars in fuel purchases -- $3.8 billion for fiscal 2014 -- that UPS makes every year. Rather than rely on financial instruments alone, deals like this one allow United Parcel Service to enjoy real diversification in its fuel costs. A quick glance at the chart below illustrates one important point: Regardless of whether one fuel is cheaper or more expensive than another, each can move in its own way. When UPS decides whether to run its vehicles on oil, natural gas, electricity, or something else entirely, it enjoys a variety of options that can reduce the company's overall risk. 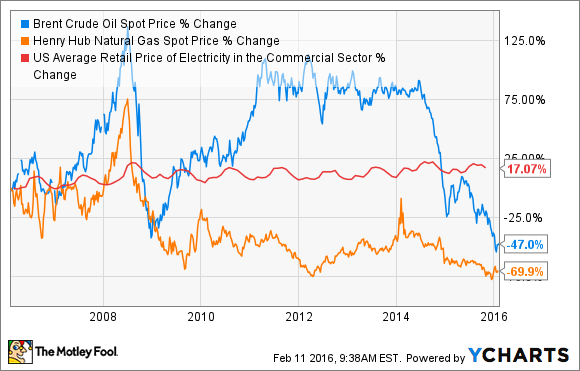 If oil prices stay low, gasoline may continue to be the best option. But if it heads higher, alternative energies may look more appealing. Clean Energy Fuel Corp. may not always be the best deal for United Parcel Service -- but it's there if and when UPS wants it. This week's announcement isn't a fundamental game changer for United Parcel Service shareholders (like myself). Between this new Texas deal and the pre-existing California one, Clean Energy Fuels Corp. will fuel up just 540 of UPS' approximately 106,000 vehicle global ground fleet. And in 2014, the company still only displaced 5.4% of its traditional gas and diesel purchases with alternative fuels like propane, ethanol, renewable diesel, and electricity. But as volatile energy (and stock) markets have shown us in recent years, the power of diversification should never be discounted. Investors should applaud small deals like this one as signs that UPS is continuing to seek out interesting and progressive ways to ensure steady earnings in the years to come.